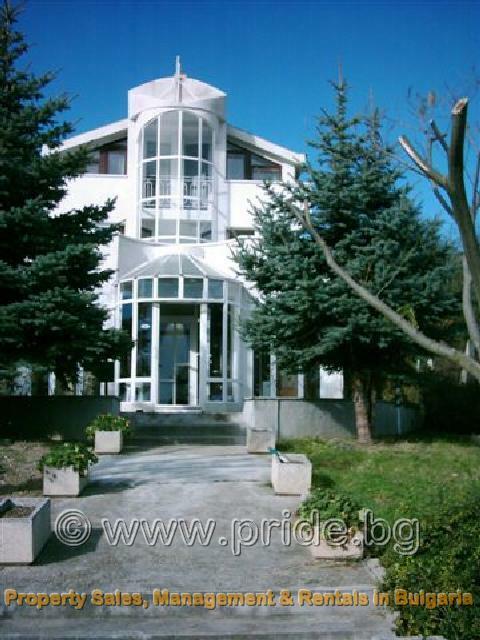 Located near Cabakum Beach and Golden Sands, this holiday villa is ideally situated for experiencing everything the Black Sea Coast has to offer. 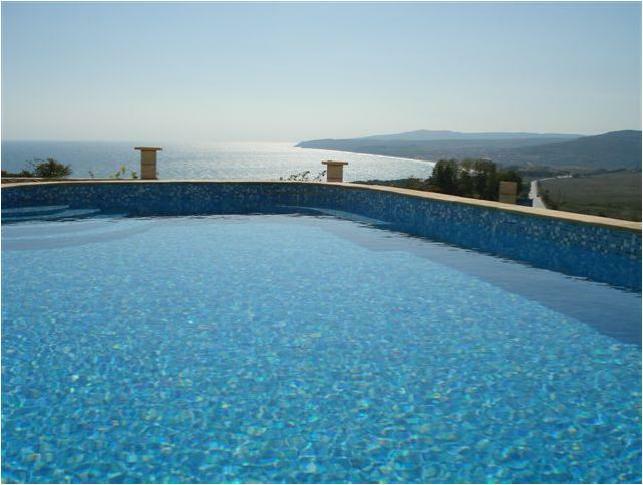 Villa Datura is situated in the wooded hills above the Black Sea Coast between Varna and Golden Sands. The villa is very spacious, featuring an open plan lounge and dining area with an unusual sunken fireplace with seating around. There is a kitchen with breakfast area, and a large utility room on the ground floor. Steps lead up to the first floor where there is a study with sofas and a second TV, the master bedroom with bathroom, and a separate washroom with toilet. 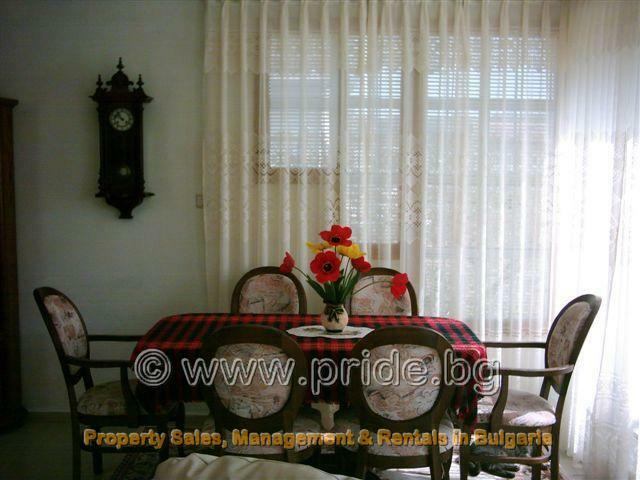 There is a huge terrace to the front of this floor, giving panoramic views over the Black Sea. A door leads through to the back of the villa, where you can find the pool. The roof of the pool area can be retracted, so can be used through the early and late seasons too. A winding staircase leads from the corridor up to the last 2 bedrooms, both with en-suite shower rooms with sink and toilet and their own balconies. The Villa is set in its own landscaped garden with more terraces to the front. Cabacum Beach is a busy resort area in its own right, very close to Golden Sands, and boasts a large sandy beach, bars, cafes and restaurants, all of which are much cheaper than those inside Golden Sands itself. It is just a few minutes walk from Cabacum into the main resort of Golden Sands. Golden Sands is the second largest beach resort along the Black Sea coast. The range of shops, bars, restaurants and discos here is fantastic, and you can spend hours wondering around the main commercial areas. The main attraction though is the beach – 4km long with soft “golden sands” and gently shelved shore. The resort lies at the foot of the Zlatni Piasatsi nature park, where virgin forests descent right to the resort centre. There are loads of other activities to do on Cabacum beach or Golden sands, such as diving, parasending, jet skiing, water skiing, volley ball and jeep safaris. A short and cheap taxi ride from your holiday villa can take you to Varna City. This extremely cosmopolitan city and is filled with pavement cafes and designer boutiques. For culture-vultures, the Archaeological Museum boasts “the oldest gold in the world”, a collection of manufactured gold pieces dating back to 4500BC. Art lovers will enjoy visiting the City Art Gallery and the Museum of Art and History, as well as several other specialist museums in the city. Please note: Villa Datura is suitable for families with children above the age of 4, this is due to the split level design on the ground floor.